Welcome to the April edition of the My Pinkalicious Blog Hop! If you just hopped over from Renee's at I Came, I Saw, I Created, then you're in the right place! If you're just stopping by for a visit and would like to hop along, go to My Pink Stamper to start at the beginning. All of the patterned paper I used (except the leaves) are from Imagine More Cards, and all flower cuts are from Flower Shoppe - I love this cartridge for flowers!! The sentiment is from My Pink Stamper's Hope and Courage stamp set. All I need to do now is add a personalized note, and I'm all set for Mother's Day! What a neat card. I love it!! I really like the concept of this card! The colors and patterns in the paper are just adorable! Thanks for sharing! Ok after this blog hop I need to hop over and get Flower Shoppe! I LOVE, LOVE, LOVE, LOVE this card! It is very sweet and charming! 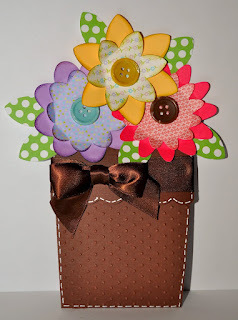 I love the button centers and the flower pot idea. Beautiful card!!!! You are so talented!!!! What a super cute card Roberta! I love the flowers you used! What a great idea for a card! The flowers are lovely! Beautiful card love the flowers. I love this - such a happy design! I love the design of this card!! The flowers are so pretty too! Very pretty!! i love the buttons for the centre of the flowers!! I just love the flower pot card. I made this as get well card for my cousin. These are just so fun to make. This is adorable! I have always wanted to make a card like this! What a great and different idea! You have given me the idea I needed for my Mommy on Mother's Day! :) Thank you for being my inspiration!!! Take care! LOVE IT!! Such bright beautiful flowers, and how clever to put it in a flowerpot! TFS! Very cute card!! 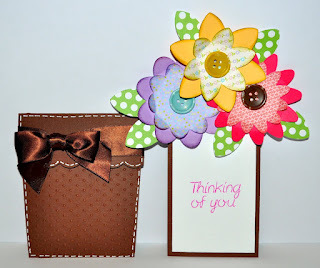 I love the idea of the card inserting into the "flower pot." The flowers are very pretty as well; love the colors! I love this flower pot card. Such a hidden surprise. That is a really cool card love it !!!! This is so gorgeous, I simply love it, gotta pin it! I have never seen anything like this! What a refreshingly new and adorable idea. I try to live outside the box most of the time (my family is mortified quite often...lol), so this is a great idea for me. Not so traditional. I think my Mom would absolutely love it, and it is not too over the top. TYFS! I love to make these cards. You did a really nice job! I love this card. So full of detail and beautiful. It's so different. I will try this one for sure. Thanks for the inspiration! what a great card. Thank you for always sharing such great ideas. I've always loved this card. I think I might make a Mother's Day card using this technique. How adorable. I'm sure your mom will love it and the cookie bouquet. I love this card, and will attempt to make it myself soon. So pretty! Great design love the flower pot! Love, love, love your flower pot card. I would love to see how you made this. :) TFS! I love this shape card. Please give the how to. Now that is a unique Mother's Day card. Love it! Love the card. Absolutely adorable. Cute! love your flowers. The idea of having the card pull out of the flower pot is genius. I love the idea of this card. I hope to use the idea for a baby card.